Mold has been receiving a lot of attention due to the vast amounts of sickness and lawsuits that have been created. Homes are now built “tighter” with much less air infiltration or ventilation which can cause a higher potential for mold growth inside the home. According to the Bureau of the Census, 35 percent of homes are damaged every year due to water or moisture. Moisture on wood, cellulose, and other organic materials used in buildings provides the fertile platform for mold growth. Allergenic molds can cause allergic symptoms such as wheezing or a runny nose. Pathogenic molds can cause suppressed immune systems, or serious health effects in a person who already has a decreased immune system. Toxic molds can cause serious health effects in almost everyone. These effects can range from short-term irritations to even cancer. Mold Testing: There are two basic methods for testing for mold. Swab, tape strips, or bulk samples can be taken of any visible growth. Air samples are taken of both inside and outside air for comparison of molds that are not readily visible. There are also several levels of standardized testing. Limited Sampling involves taking swab, tape, or bulk samples as directed by the client of visible fungal growths in the home. This is the least expensive and most direct method of identifying a known fungal source, and can easily be added to a normal home inspection as desired by the client. A Mold Screening includes a visual assessment of the entire home, identifies “red flags” for mold, and a limited sampling for mold taken at each “red flag.” This can be done as a stand-alone mold inspection, or in conjunction with a home inspection when a more thorough assessment is desired. A Mold Survey identifies and determines causes, and provides corrective measures for all mold sources discovered in the entire home. It includes a visual assessment of the entire home, limited sampling of all “red flags,” and air samples of both inside and outside air. This service is mainly used once a problem has been identified and remediation specifications are needed to be produced by the Certified Industrial Hygienist. ERMI/ARMI Testing: Since mold is widely present in the environment, and the study of molds adverse health effects is not an “exact science,” the EPA has developed the Environmental Relative Moldiness Index. This is a scale by which you can rate the amount of certain molds in a home against the national baseline set by the EPA. This test can be a relatively reliable method of determining if a Mold Survey is appropriate. 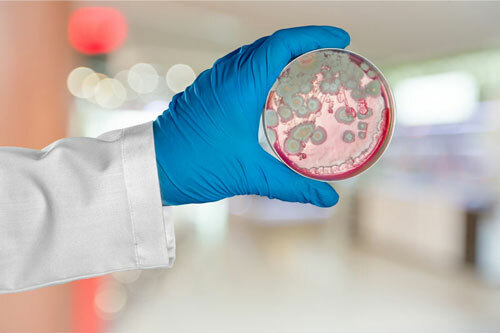 If you have concerns about mold in your Charlotte area home, please contact Colony Home Inspectors mold inspectors to learn more about which mold test may be appropriate for you, or click on the links below for more information.